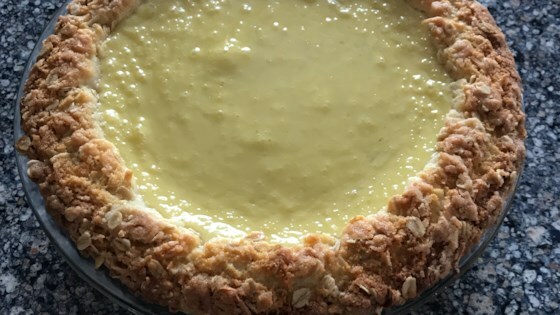 "Easy lime pie with ANZAC cookie crust." Preheat oven to 350 degrees F (175 degrees C). Lightly grease a 9 inch glass pie pan. In a medium bowl, mix together oats, coconut, flour, and sugar. In a separate bowl, mix together melted butter or margarine, corn syrup, and baking soda until frothy. Add corn syrup mixture to oat mixture and stir until ingredients are thoroughly combined. Press mixture evenly into bottom and sides of pie pan. In a medium mixing bowl, combine condensed milk, lime juice, egg yolks, and lemon rind. Beat on medium speed 1 minute. Pour mixture into pie crust. Bake in preheated oven for 20 minutes, until firm in center. Do not allow to brown on top. Chill before serving. Use fresh key lime juice if you can, as it adds the biggest flavor. This is phenomenal. The crust tastes like a macaroon. Don't change anything here!